We offer 6 professionally decorated private bedrooms which come standard with ceiling fans, complimentary Wi-Fi and LED TVs with premium cable channels. Each bedroom has it’s own closet and live plants. 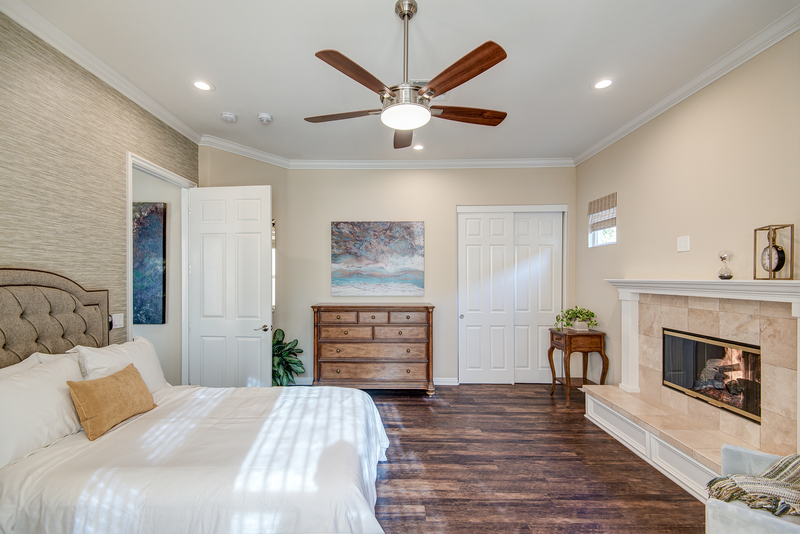 We offer 2 premium oversized bedrooms with fireplaces. 5 bedrooms come with full-size beds and one comes with a twin size bed. There are 3 fullsize bathrooms. Our bedrooms are licensed for ambulatory to bedridden residents to accommodate aging in place. Our rooms start at $8500 per month. Our assisted living homes are convenient for families in Orange County, CA and the surrounding areas. We encourage our residents to have visitors and we have a “no appointment needed” policy between the hours of 10am and 7pm. Let us know in advance and we’ll make sure you’re included in a meal or activity while you’re here! We’d love to have you over! Let us give you a personal tour of our home. Updated Details on Our Open House! Adagio San Juan is dedicated to safety, quality senior care, premium amenities and creating a home environment for the elderly in San Juan Capistrano, CA that you will love to live in and your family and friends will love to visit.